Whether you’ve already taken down the Marcano crime family, or you’re still new to town, the streets of Mafia III have more stories to tell. Today, the “Faster, Baby!” DLC is ready to roll – and with it come a number of game enhancements, gear, new vehicles to add to your fleet. And, of course, there’s the story of small town corruption choking Sinclair Parish. It’s up to Lincoln Clay and Roxy Laveau to do something about it. What's New in "Faster, Baby!"? There’s a whole new part of town to drive through – and tear up. Sinclair Parish is a small rural township in the countryside with lots of opportunities to tear through turns, jump gaps and run from the law. Oh, sure, you’ll have your fill of Hollywood-caliber car chases, enhanced with new “Faster, Baby!” additions like the ability to activate slow motion. It’s a new way to carve tight corners and thread-the-needle between narrow gaps while evading pursuit. ”Faster, Baby!” gets straight to the action with high-octane driving and more car combat. With this new DLC release we’re introducing new combat mechanics perfectly suited for causing destruction on-the-go. Namely, you’ll now have access to proximity mines so you can lay out traps on the backroads or in enemy encampments. Also, take advantage of the ability to toss grenades from your car while enemies are in hot pursuit. …and there’s a great story as well! “Faster, Baby!” takes place alongside events in the main game. A civil rights leader is murdered while investigating local sheriff “Slim” Beaumont – and other activists are next on the list. As the story unfolds, you’re unlocking new cars for tooling around New Bordeaux, new outfits and new gear for taking down Slim – as well as the Marcanos. How Do I Start Playing "Faster, Baby!"? 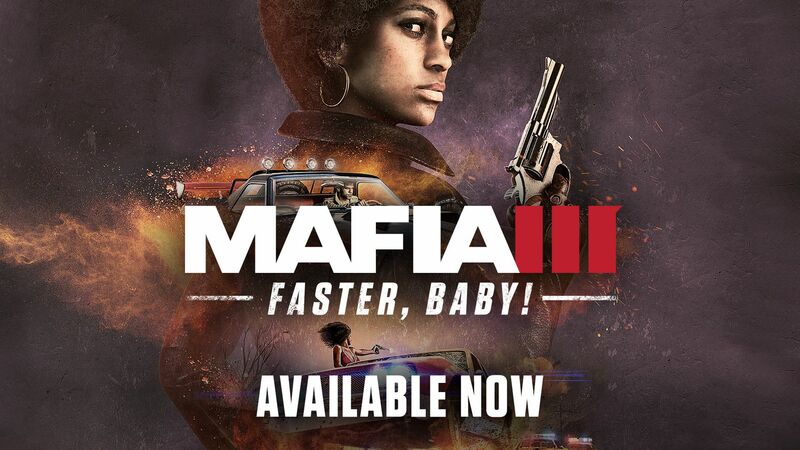 The Deluxe version of Mafia III, which is bundled with the Season Pass, includes “Faster, Baby!” as well as the upcoming “Stones Unturned” and “Sign of the Times” DLC. So, if you already purchased the Deluxe version or a Season Pass, no other purchase is required – just get to downloading. Otherwise, the “Faster, Baby!” DLC is now available for purchase from your favorite digital store. Just start driving around. It doesn’t matter whether you previously finished Mafia III or you’re just starting off on your own personal tale of revenge, feel free to explore all that Sinclair Parish has to offer. If you’ve sealed Marcano’s fate, just start driving southwest until you hit the country. Just started? You’ll still need to have all three Lieutenants (end of Act Two) before you’re able to head outside of town. So plan for a nice little country drive. Uncover the corruption. To kick off the story – and to take down Slim – head over to meet with Charles “The Voice” Laveau after the end of Act Two to hear what’s happening in Sinclair Parish. What happens next is up to you and Charles’ daughter, Roxy. Pay attention! There are a number of new gameplay elements – and interactive items throughout Sinclair Parish – that change how you’ll play the game. Keep an eye out for those new tutorial screens. Don’t forget – “Faster, Baby!” is just the first paid DLC for Mafia III. We still have more stories to tell and a bunch of additional content coming in the “Stones Unturned” and “Sign of the Times” DLC that are also included in the Season Pass. And that’s on top of the free vehicle modifications, races, customizable outfits and extra weapons we’ve released since the game’s launch.